Keeping your personality classy is one of the important factors to consider. Right from shoes to apparel you wear everything must look classy to attract people attention. There are few who consider everything to be branded. From socks to watches, they make sure it is from the top brand. So if you are looking for socks, then luxury knitwear brand from Germany called Falke is selling the most expensive socks in the world. These pair of socks is made from Vicuna, the fabric made from ultrafine hair of the Peruvian Vicuna which is quite rare. These socks will be sold for $1,188. The socks along with 20 pullovers with same Vicuna fabric and each pullovers costs $3,300. Socks come with golden-brown presentation box resembling Llama- like camelid originating from Peru. These Falke socks are available in one colour, the golden brown. The wool used in the socks is so delicate that it can’t be dyed. One Vicuna produces one pound wool. The Vicuna socks are available in 10 pairs only, and if you want to buy one then you need to order quickly. 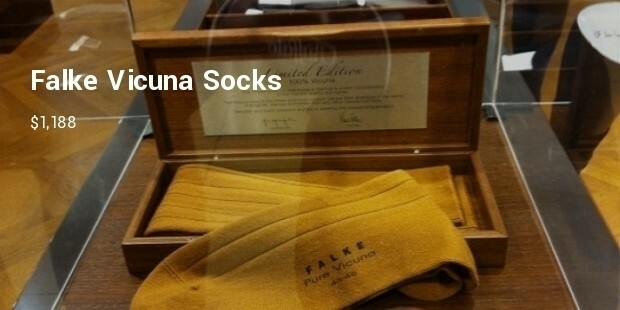 These Vicuna socks are Falke’s autumn/winter collection. These socks will be available in two neckline choices v-neckline and roll. 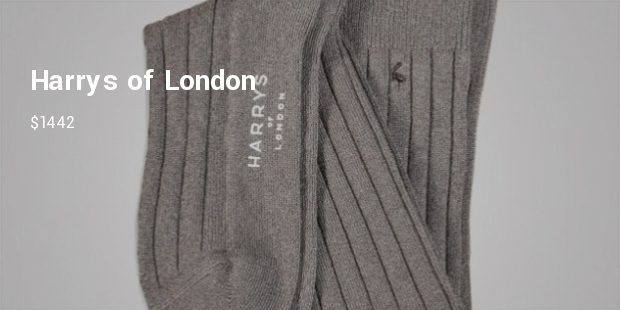 Apart from these socks, there is yet another Italian brand, “Harrys of London”. This Italian made charcoal grey knee-high end hosiery is 100 percent from Cervelt, which is known as Diamond of cutting fibre. This limited edition of most expensive pair of socks is sold at Harrys of London stores online $1442 each. Socks are integral part of attire and having branded socks, especially from the above brands then you are going to be the centre of attraction. Moreover, be ready to fetch dollars on buying these expensive socks.